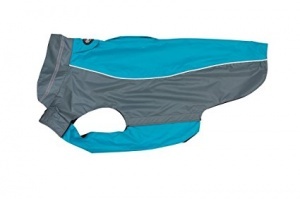 The BUSTER Rancoat material makes this large dog coat fully waterproof and windproof. The BUSTER Raincoat is easy to put on and take off. Fits male and female dogs. The neck is adjustable to fit your dog’s size. The sleeveless cut gives your dog freedom of movement when running and playing. The dog lead can exit the coat through the specially designed double zipper even when your dog wears a collar or harness.